One of the game genres that I have always loved was the point-and-click puzzle genre. I love spending hours in games like Broken Age and Zack & Wiki: Quest for Barbaros’ Treasure trying out all different object combinations and gradually unlocking parts of the story. I was extremely excited then when I was able to try out Ghost Giant for the PlayStation VR at this year’s E3. The concept behind Ghost Giant is simple: You play as a giant ghost from a first person perspective and you solve puzzles. Because you’re a ghost, people cannot see you, though you can interact with objects and the world environment around you by using the PlayStation Move controllers as ‘hands’. That said, you’re not totally alone: a character by the name of Louis can see you and he talks with you throughout the game world of Sancourt. When my demo started, I found myself towering over a small, storybook town. As I tested out the limits of how I could look around my environment, I could see that there were a lot of interactive elements present ranging from a giant lever to trash cans. Not long after I started, Louis saw me and ran off into his home, locking the door. I then had to pull a giant lever situated in the world environment to turn around a home, which had a goat inside that was clutching a giant key while watching television. Even though I could not interact with the goat directly (I’m a ghost, remember? ), I could change the channel by pushing a giant red button next to the goat until the sheep-fence-jumping channel showed up and he fell asleep. After unlocking Louis’ house with the key and moving his furniture around, Louis escaped outside to hide in some trash cans. After plucking the lid up, Louis ran again towards some bullies that began to antagonize him. I scared the bullies off with a ghost doll that was inside of another bedroom, and it was then that Louis started to talk to me as a friend instead of a scary ghost. After a short bit of dialogue, the demo ended. 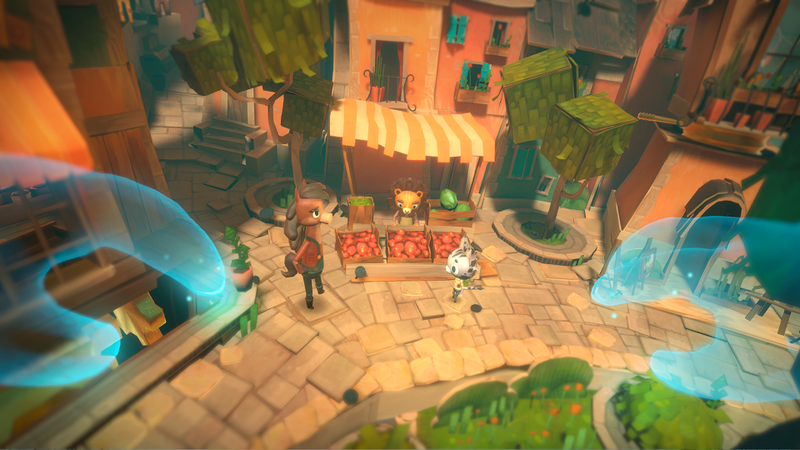 Ghost Giant takes place in a colorful world that is very much akin to that of a storybook. (Images courtesy of Zoink Games). As I stated in the beginning, Ghost Giant is a point-and-click puzzle game brought to the 3-D realm in PSVR with room scale-esque gameplay. And fortunately, it works. 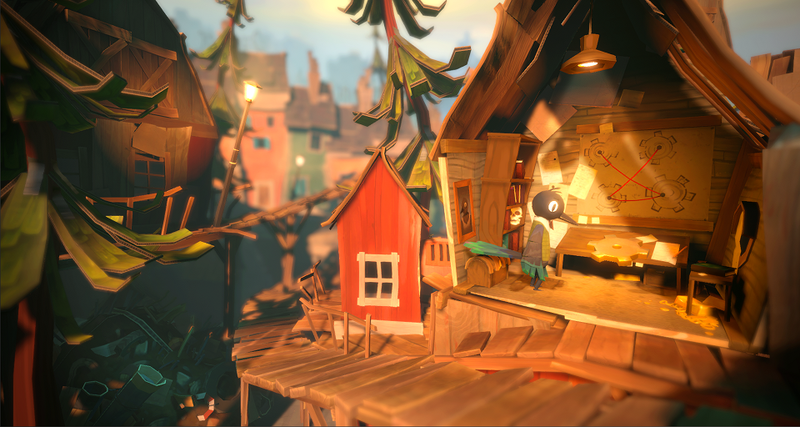 The puzzle solutions in Ghost Giant‘s demo were able to be logically deduced from the gameplay and what you can see and utilize in the surrounding world, and there was not a single bit of it that was horribly done or impossible to figure out (The Longest Journey‘s inflatable duck puzzle comes to mind as an excellent example of this). For this type of game genre, that is the highest praise possible. It is therefore only icing on this proverbial cake that Ghost Giant’s world aesthetics and characters are spot-on as well. Even though my demo was short, I felt like I was already connecting with Louis and that this would be a true partnership adventure between myself (as a…ghost giant) and living, breathing Louis. Finally, there were no concerns about VR sickness with this game, due to my giant character being perfectly stationary within the world that I was to interact with (other than when I physically moved around to interact with things). 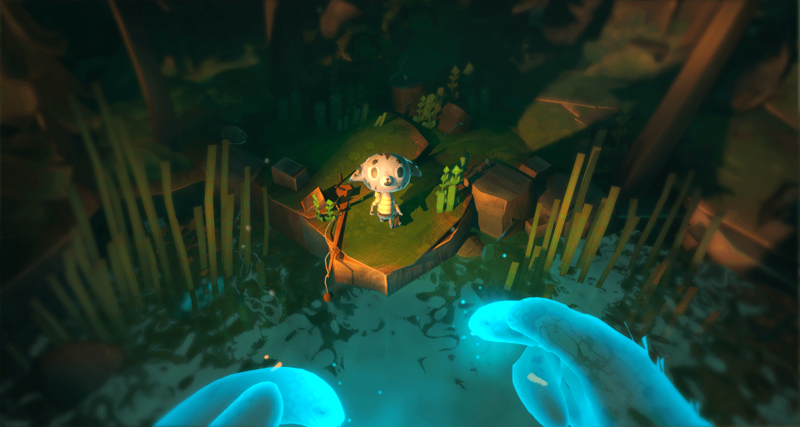 Even though you play a giant ghost in Ghost Giant, you can still interact with Louis, as shown here. (Image courtesy of Zoink Games). Overall, I loved this demo of Ghost Giant. It has so much charm and fun to it, and I cannot wait for the full game to come out so I can play it. This game turned out to be one of my personal highlights for E3 2018, and it serves to really show off how the PlayStation VR can push boundaries and tell stories in novel, exciting ways. Ghost Giant is currently not available for preorder, though I will definitely be doing so when it becomes available (and of course, we will be letting you know when it is too). Do you like point-and-click adventures? 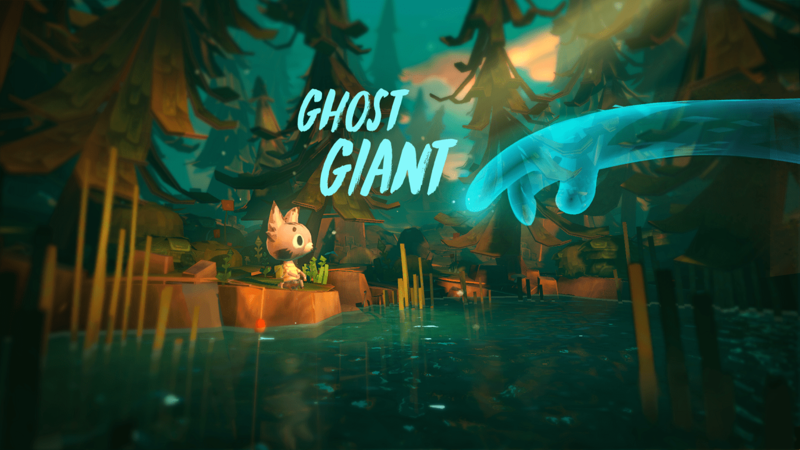 Are you excited to pick up Ghost Giant for PSVR? E3E3 2018Ghost giantPlaystationplaystation vrpoint and clickpuzzleZoink GamesZoink!